January 29, 2017 January 29, 2017 Dan O. Hate to say it, but journalism hasn’t gotten much better. Christine Chubbuck (Rebecca Hill) is not all that happy with her life. While she’s got a reporting job at a local news station, the stories that she seems to want to really dive into and make her name on, unfortunately, don’t seem to get much attention or done at all. The station is changing, just like the rest of the journalism world itself is, too. That’s why Christine sticks to her guns no matter what and tries to get the juiciest, meatiest stories she can find. However, there’s a lot more going on in Christine’s life than just her job; she’s also trying to find that one, special someone so that she can get married, have kids and do everything that she was brought up to do. She thinks she has that opportunity with the star reporter at the station (Michael C. Hall), but she’s so closed-off and awkward, she doesn’t know how to go about initiating anything resembling a conversation, let alone, a date. Meanwhile, her mother (J. Smith-Cameron) is now living with her, making her more and more frustrated about life, leading her to act out in some despicable, shocking ways. The story of Christine Chubbuck is, needless to say, a very sad one. While there’s a good part of this movie that was most definitely made-up for the sake of having an actual movie, the idea that someone who just wanted to make something of a difference in this world, tell interesting stories, find love, get married, have kids and just be happy, if anything else, is relatable to life in general. And knowing the real story behind the subject, as well as director Antonio Campos’ past two flicks (Afterschool, Simon Killer), it’s hard not to expect Christine, the movie, to be an absolute dark and deep breath of depression. But it’s actually kind of not. In ways, it can actually be pretty funny, in that it makes fun of certain characters, while also, by the same token, embraces them for who they are, especially Christine herself. But no matter how funny the movie can get, there’s always this underlining air of sadness that’s mostly always felt, even in some of the more compelling scenes; one in particular, where we hear of all of Christine’s problems in a very straightforward, manner-of-fact way, starts off one way, and ends a totally different way then you’d ever expect. It’s definitely a credit to Campos and writer Craig Shilowich for coming together and figuring out how to make this forgotten figure in our pop-culture’s history, story, still relevant and heart-wrenching. Why should we care about this girl, other than the fact that she killed herself on live television? Well, the movie tells us why, not forgetting about her flaws, while at the same time, not forgetting that she was a human being who wanted just the same as you or I. But as much as Campos and Shilowich deserve the credit here for telling Christine’s story to the best of their ability, it’s also a lot of credit to Rebecca Hall, giving it her all and then some, in a role that finds her really stretching her acting-muscles and it all coming off so perfectly. A lot of people went crazy this awards season about Natalie Portman’s portrayal of Jackie Kennedy and how she nailed down the voice, but also made us see beneath the fine dresses and speech – Hall does that with Chubbuck, but I think, almost does a better job. Yeah, don’t be on the opposite end of Letts’ wrath. For one, it’s definitely a little hard to get used to Chubbuck’s manner of speaking and the way she carries herself in just about every conversation she has, but Hall works with it and shows us that there’s more to her than just an awkward-presence, and instead, a person who solely wants to be seen, loved, and cared for, regardless of who said person may be. It’s actually quite heart-breaking to watch, as even though Chubbuck may think she’s the smartest person in the room, the movie still shows us that nobody’s paying attention to her and because of it, she’s driven deeper and deeper into her depression. Christine may not place itself as a sort of cautionary tale, or even a cry for help, for those who can’t cry for themselves, but at the end of the picture, it definitely seems like that. And the rest of the cast is quite good, too, showing us how each and everyone interacts with Chubbuck, as hard as it sometimes may be. Michael C. Hall plays the one reporter she falls for and while he may seem like the typical d-bag, there’s actually more to him as the movie progresses; J. Smith-Cameron is a very good actress, but unfortunately, her role here does seem very stuffed-in, as if the character may have not been all that much of a presence in real life, but the movie felt like it needed her around; Maria Drizzia plays Christine’s co-worker who actually listens to her and, in other ways, looks up to her; and Tracy Letts plays her boss who always yells, drinks, and smokes, and he’s pretty great at it. Like I said, no one here is a bad person, or a good one – they’re all just people. 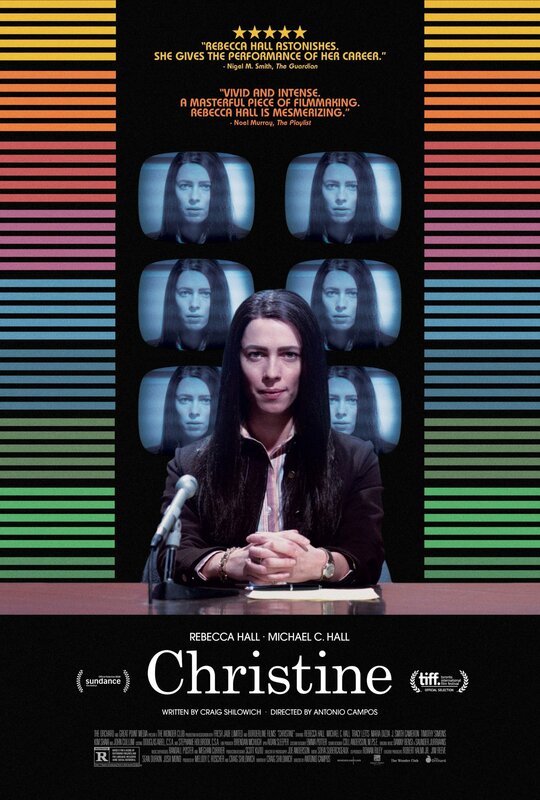 Consensus: Well-acted and insightful, Christine is an interesting look at one of TV’s more forgotten-figures, showing us a sad, but always compelling look into a life full of depression and some hopes. Very, very lonely there in the journalism world. I just watched this yesterday and really enjoyed it. It makes you feel for Christine (and think about journalism). Nice review. Great review! I remember learning about her during one of my journalism classes years and years ago. I’m surprised this movie didn’t get more attention, especially for Hall’s performance. I have yet to see it, but, like your review, I’ve heard great things!